We are the manufacturer of chess equipment that specialized in carving chess. All of our products are handmade product that carved by our expert craftsman from Java island. We have many kind of carving chess pieces, board, chess table, outdoor furniture, house decoration, checker pieces, wooden trophy, and many more wooden products. All of our products are made of Teak wood. We choose the best Teak wood as our main material. The Teak wood must be dried first, before it processed and carved. By using this wood, our products are durable in any seasons and weathers. So that, you can use it for outdoor game or outdoor decoration. 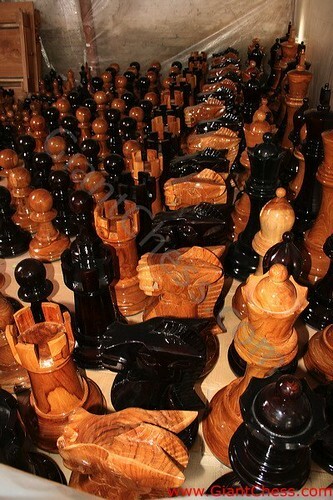 In the picture above, you can find wooden chess pieces that has made from Teak wood. Those chess pieces are polished well in brown and black with glossy touch. Looks unique and interesting.